“I Will Cause Thy Message to Reach the Corners of the Earth”: Scandinavia’s largest mosque opened by Ahmadiyya Muslim Community – Is the West ready for Islam? The world Head of the Ahmadiyya Muslim Jamaat, Hadhrat Mirza Masroor Ahmad officially inaugurated the Baitul Nasr mosque in Oslo on Friday, 30 September 2011. The mosque is Scandinavia’s largest and has a capacity of 4,500 worshippers. Visible from a great distance, the mosque has already established itself as a national landmark and a symbol of peace. The mosque was officially inaugurated by Hadhrat Mirza Masroor Ahmad during his Friday Sermon, which was broadcast worldwide on MTA International. The opening of the mosque also received a lot of media attention and was covered extensively by Norway’s national broadcaster, the ‘NRK’ amongst others. During his address, His Holiness said that various media organisations had conducted interviews with him during the past week. He said each had asked him what the purpose of the mosque was and what his feelings towards it were. He said that to all he had replied that the mosque was a place where peace in society would be fostered through the worship of the One God. Rest assured that every Ahmadi Muslim who enters this mosque will have a true and deep love for mankind and will also fully comply with the laws of this nation. Rest assured that every Ahmadi Muslim who enters this mosque will be at the forefront of trying to eliminate cruelties whereever they occur and will be ever ready to make every sacrifice needed to achieve this goal. Mubarak to All Ahmadi Moslem in Norway, we are Ahmadi Moslem in Indonesia are very happy to hear the good news. Alhamudulillahi, May this Mosque be a place where the unity of almighty Allah will be manifested. 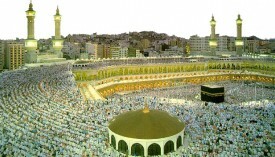 May it be a source of peace and may Allah bless all those Who will be worshiping therein. Truly, the message of Imam Mahdi, Hazrat Mirza Ghulam Ahmad (a.s) will reach every nook and cranny of the earth, even if the disbelievers hate it!